"Is that guy still in England?" "I don't know. I think maybe he dropped off the radar and became a tramp or something." That conversation would require 2 of my readers to be in the same place at the same time which is highly unlikely, but the question is valid. No, I'm still here. The weather is actually really nice now, so for the last several weekends I've been working furiously to get my touring bike up and running. Here it is back in October, when I had added some old scruffy parts to the rusty frame I obtained from the bike graveyard. After that, it sat in the garden quietly rusting over the Winter. 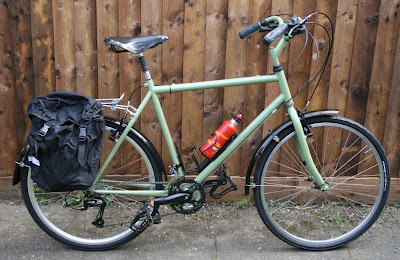 Here it is now, fully kitted out for touring. I took it out yesterday for a test run, and it just chewed up the kilometers. I put 13km on it with no effort at all. 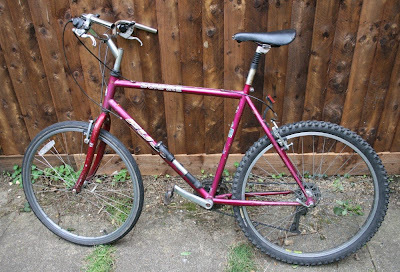 I'm really pleased with it - I've never ridden a bike that rolls so smoothly. Unfortunately, there isn't really room in my bedroom for me and the bike, and since I love the bike more and it sure as hell isn't going outside, last night I slept on the lawn. Yes, seriously. Okay, it's not as bad as it sounds. Since the bike is up and running now, I'm hoping to do quite a bit of touring with it. 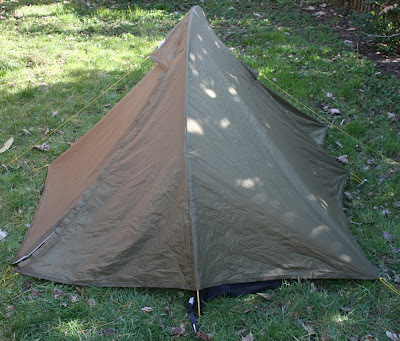 I picked up a cheap MacPac tent and last night I slept in it on our lawn to test it out. Mostly, what I discovered is that Cambridge is a very noisy place on a Saturday night, and the dawn chorus starts at 4:52am. Oh, and the new flatmates are now worried that I'm a lunatic. I'm pretty pleased with how it has all gone so far. Next weekend, assuming the weather is okay, I'll do what is known as a "shakedown ride", which is a practice trip to see if everything holds up okay on the road. There's a camp ground about 20 miles from here, so I'll head over there with the bike fully loaded, cook myself a meal with my new little stove, and sleep in the tent. Holy cr&p - thats like extreme makeover for bikes... nice job Jim!